. Symbols and Motives in Asian Art .
. zui-un 瑞雲 auspicious cloud art motives . 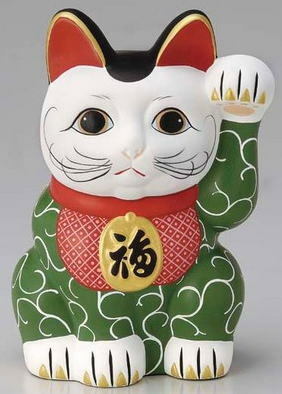 karakusamon 唐草文 Lit. Chinese grass motif. 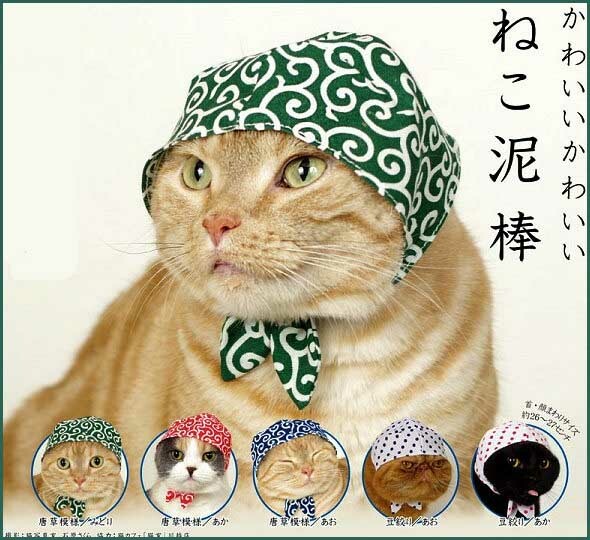 Also called karakusa 唐草. 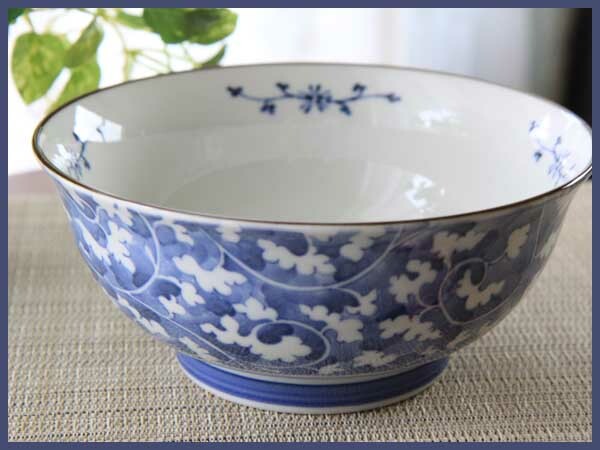 Often used interchangeably with karahanamon 唐花文 (Chinese floral motif). A foliage-scroll pattern seen on textiles and crafts including ceramics, metal work, and lacquerware as well as sculptural and architectural detailing. 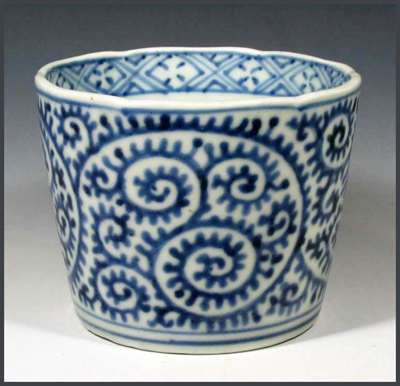 Although the term refers to floral and plant motifs introduced to Japan from China, most of the motifs originated in Central Asia, India, Persia, and Arabia. Some came from as far west as Greece and Egypt. The patterns are generally characterized by a flower-and-leaf motif linked by continuous, repetitive, scrolling vines or tendrils. Countless variations developed featuring a wide range of flowers and plants, including the lotus rengemon 蓮華文, peony botan karakusa 牡丹唐草, grape budo karakusa 葡萄唐草 and precious flower hosoge 宝相華 combined with wave-scroll patterns of palmette (of Greek origin) nindomon 忍冬文 or arabesques, the continuous vine patterns probably of Persian origin. In Japan, the patterns first appear on extant objects from the 8c, with many examples found among the treasures of the Shosoin 正倉院. The motifs were then further adapted to Japanese taste in the Heian period especially for dyed textiles yuusoku mon'yo 有職文様. The more exotic motifs often were replaced by flower and plants commonly found in Japan, such as the plum (prunus), wisteria, camelia, chrysanthemum, bamboo and vine sasatsuru mon'yo 笹蔓文様, pine, or paulownia kirikarakusa 桐唐草. 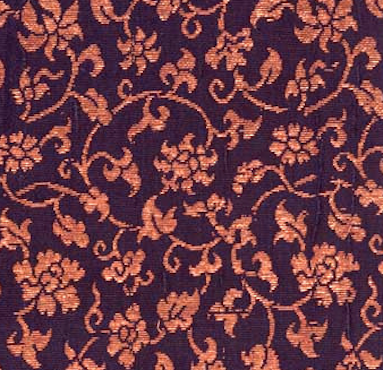 The motifs were used extensively on silk brocades, damask, and later were adapted for stencilled textiles. 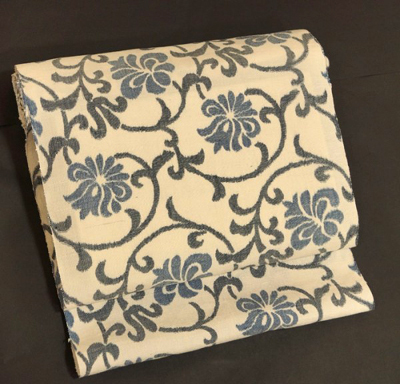 From the 17c on, karakusa designs were used to decorate a wide variety of clothing, and cotton futon 布団, as well as furoshiki 風呂敷 fabrics. The designs varied from fine to small to medium-sized patterns. Other variations to note are: cloud-scroll motif unki karakusa 雲気唐草 a double clove motif kutsuwakarakusa 轡唐草 or a type of vine scroll pattern that almost forms a circular pattern wanashi karakusa 輪無唐草. Most arabesque patterns have a centrally positioned motif *chuushinkasari 中心飾 from which flow rhymical arabesques that are exactly the same but run in opposite directions kinsei karakusamon 均正唐草文. The henkou type pattern, however, runs continuously from one end of the broad to the other. One example, on a tile unearthed at Fujiwarakyuu 藤原宮 (694-710), has a predominant curvilinear core from which, and around which spring dynamic lines ending in simple curlicues. Some scholars suggest that the curlicues, especially those passing the center of the tile, might represent a cloud motif. Some of these continuous patterns have no end borders wakitai 脇帯. Others have clearly defined end borders filled with a continuous linear zigzag motif kyoshimon 鋸歯文 created along the lower border shimotai 下帯. The upper border uetai 上帯 is filled with a bead pattern shumon 珠文. 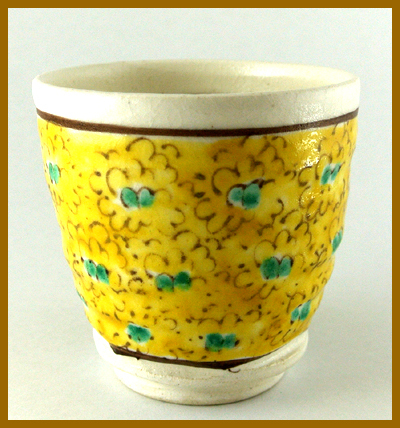 Some henkou patterns resemble the so-called honeysuckle motif and are called henkou nindou karakusamon 扁行忍冬唐草文. Also abbreviated to budou karakusa 葡萄唐草. 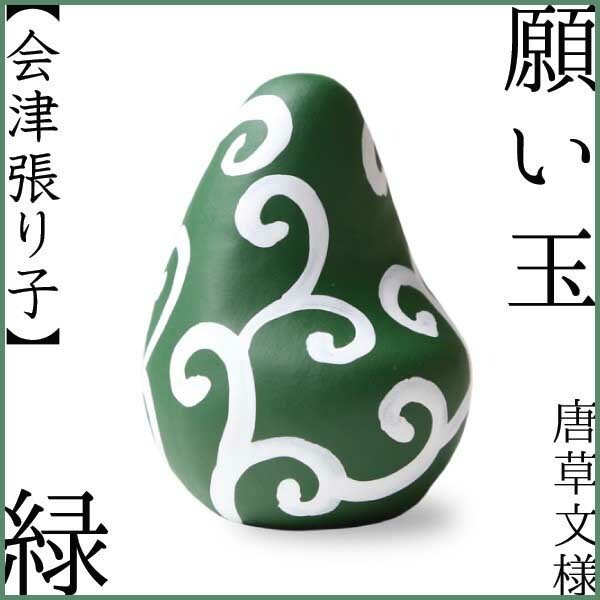 A grape-patterned arabesque used on the pendant gatou 瓦当, of a broad concave eave end tile nokihiragawara 軒平瓦. Tiles with this motif are found on buildings at Okadera 岡寺 in Nara and its vicinity. The grapevine motif is found in ancient Greece, Rome, and the Near East. 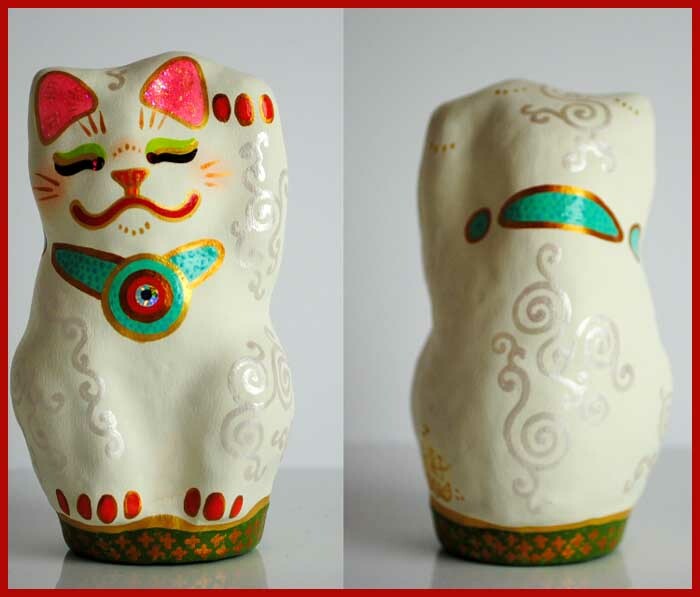 It reached China and was first used during the Northern Wei dynasty (Jp: Hokugi 北魏) in caves at Yungang (Jp: Unkou 雲崗) and Lungmen (Jp: Ryuumon 龍門). During the Sui and Tang dynasties, it was widely used at Chang-an (Jp: Chouan 長安). 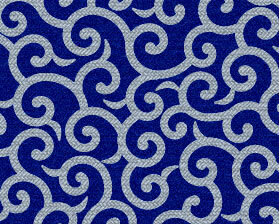 In Korea it was used as a tile pattern during the Unified Silla period (Jp: Touitsu Shiragi 統一新羅). Tiles with a grapevine motif can be dated to the late 7c. There are four slightly different renderings of the pattern: three found at Okadera and one at Jikouji 慈光寺 ruins, both in Nara. Across the upper face of each tile, there is a zigzag motif kyoshimon 鋸歯文, inazumamon 稲妻文, separated from the grapevine pattern by a high ridge. hira karakusagawara　平唐草瓦 Also called hira karakusa 平唐草. A broad concave eave-end tile nokihiragawara 軒平瓦, decorated with an arabesque pattern karakusamon 唐草文, on the pendant part gatou 瓦当. It was employed especially during the 7c-12c. The arabesque motif later fell into disuse, but the tile was still called karakusagawara 唐草瓦. Abbreviation of housouge karakusamon 宝相華唐草文. A type of Chinese arabesque design karakusamon 唐草文, combining images of the peony, lotus and other flowers in a repeated scroll pattern. A variety of precious flower pattern *housouge 宝相華. Abbreviation of budou karakusagawara 葡萄唐草瓦. A roof tile, often an eaves-end tile, whose pendant edge is decorated with an arabesque pattern combining images of the peony, lotus and other flowers botan karakusa 牡丹唐草. A common term for the broad, concave eave-end pendant tiles that are placed along the gable overhang keraba 螻羽 and extend beyond the edge of the bargeboard hafu 破風 of the inclined eaves of a gable, or the gable on the hip-and-gable roof, kirizuma yane 切妻屋根 or irimoya yane 入母屋根. These tiles were originally named for the arabesque motifs karakusa 唐草 that decorated the pendant. The motif was most popular from the 7c-12c. Even when the motifs changed, the old name remained in use. 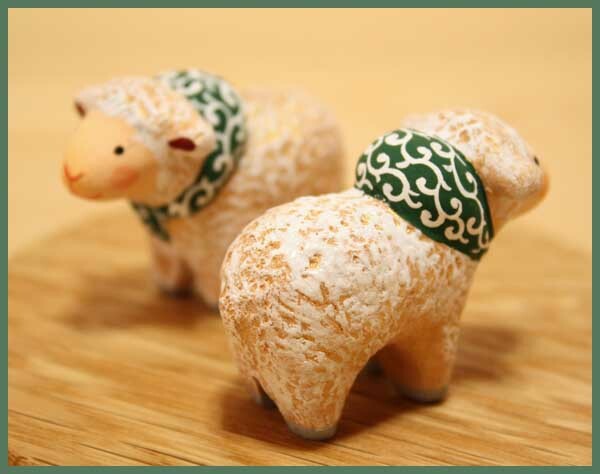 named after the arabesque pattern *karakusamon 唐草文 often found on the pendant edge. ..... 2　Any tile decorated with an arabesque pattern at its edge. A pantile decorated with an arabesque pattern is called san karakusagawara 桟唐草瓦. Variations include the flat arabesque tile hira karakusagawara 平唐草瓦, corner arabesque tile sumi karakusagawara 隅唐草瓦, gable arabesque tile keraba karakusagawara 螻羽唐草瓦 or multi-layered-box tile juubakogawara 重箱瓦. These words are sometimes abbreviated by omitting the word kawara. A perfectly balanced design around a symmetrical central motif. A type of arabesque found on the pendants gatou 瓦当 of broad, concave, eave-end tiles nokihiragawara 軒平瓦. Examples have been excavated at the site of the Ikaruga-no-Miya 斑鳩宮 near the east precinct of Houryuuji Touin 法隆寺東院 and various temples sites dated around the mid-7c. Also suikazura karakusamon; also nindou karakusa 忍冬唐草. Lit. honeysuckle arabesque pattern. 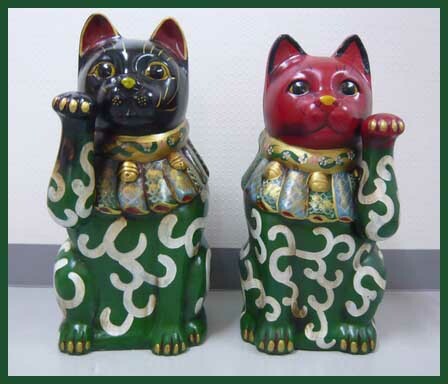 A pattern used to decorate the pendants *gatou 瓦当 of broad, concave eave end tiles nokihiragawara 軒平瓦. 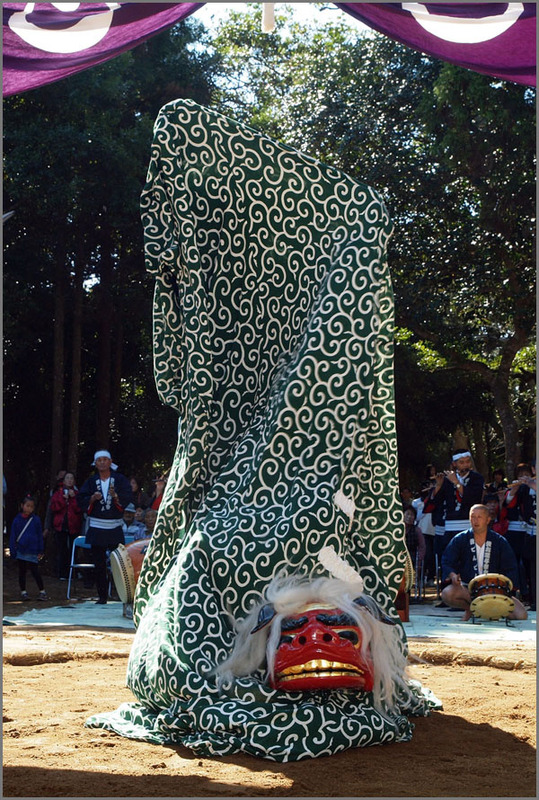 Existing examples have very fluid, delicate vine patterns which are rendered with a leaping vitality, as in those found at Houryuuji 法隆寺 and Hourinji 法輪寺, in Nara. This motif may be arranged symmetrically, to the right and left of a central design chuushikazari 中心飾. It may be deeply and heavily carved as exemplified by a fragment found at the Sakadadera 坂田寺 site, in Nara. It may also have a continuous pattern without a central motif henkou karakusamon 扁行唐草文. Some fragments from Houryuuji have a large heavy, fan-shaped motif senkei nindou karakusamon 扇形忍冬唐草文 with the same motif alternating between being rightside up, like a tree, and the next inverted. This motif is also called palmette or apricot leaf arabesque motif kyouyou karakusamon 杏葉唐草文 kyoyo karakusa mon. 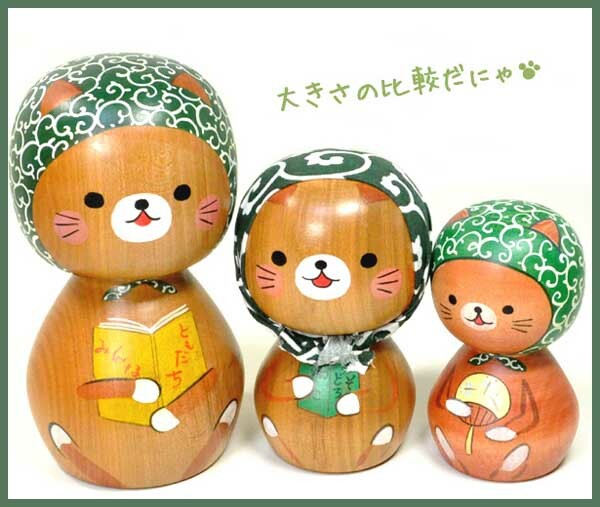 In this paper I discuss the properties of a pattern known as "Karakusa". Karakusa is Japanese and means "foreign plant" or "winding plant". The pattern consists of various spirals, and these spirals take their shape from vines and other natural forms. I will examine and demonstrate how features of the pattern were abstracted from these natural forms. In addition, it will be argued that an algorithm employing a mathematical element could be involved in generating those features, and I will claim that we will be able to utilize this algorithm for generating new spiral forms. 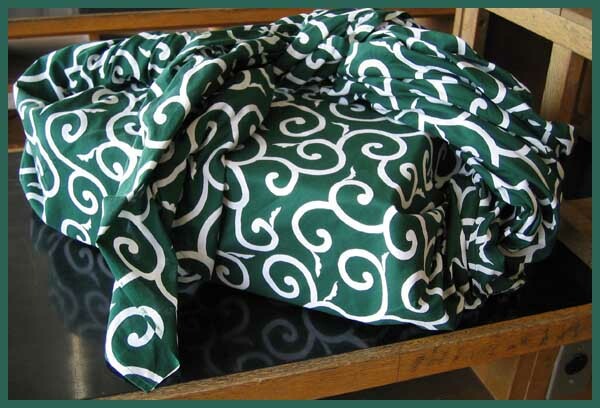 In this study I examine a Karakusa pattern familiar from its use on Japanese wrapping cloths. In this particular pattern only a geometric spiral is employed. It is a simple pattern constructed from many spirals, each of which extends freely in all directions. In this paper I examine such features in turn and describe my results. mijinkarakusa, mijin-karakusa みじん唐草 "small plant pattern" "mini-arabesque"
takokarakusa, tako-karakusa 蛸唐草 "octopus arabesque"
tsurukakakusa, tsuru-karakusa 蔓唐草 "vine arabesque"
CLICK on each image for more photos !
. 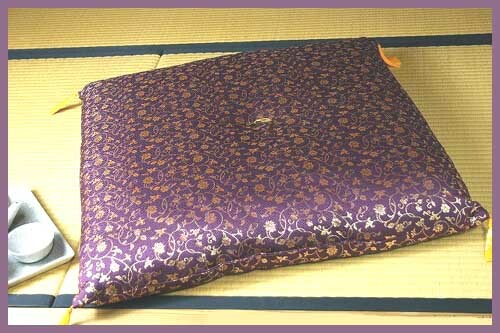 furoshiki 風呂敷 wrapping cloth . 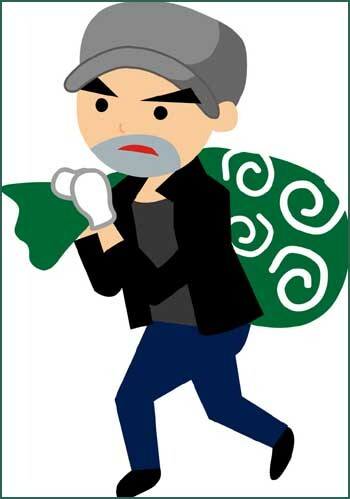 Thieves in the Edo period (and now) used to wrap a Furoshiki around their head to hide their features and carry away the booty. Halos decorated with Chinese foliage design karakusamon 唐草文 and a thousand miniature buddhas senbutsu kohai 千仏光背 were also produced in the Tenpyo period. 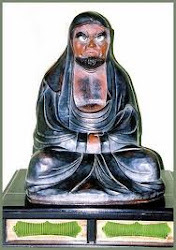 A good example is Rushanabutsu 盧舎那仏 (779) in T唐招堤寺, Toshodai-Ji, Nara.
. koohai, kouhai　光背 halo, mandorla of a statue .
. mibu koohai　壬生光背 halo of the Mibu type . The border of the Halo is decorated with Chinese style plant motifs karakusamon 唐草 in openwork sukashibori 透彫.
. kani botan karakusa kamon 蟹牡丹唐草文 family crest from Nabeshima . Born in Shiga. Member of Hototogisu and 山茶花. 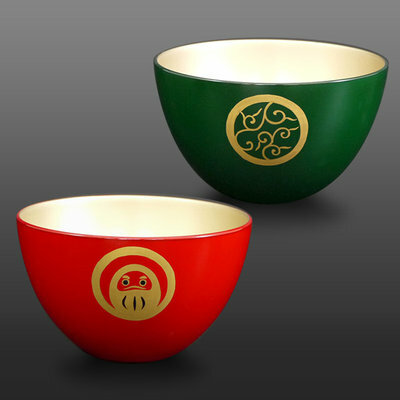 CLICK for more bowls !